WalMart makes no apologies for kicking off the holiday shopping season during dinner on Thanksgiving. "We get underway at 6 p.m. and I'm really happy with it," said Greg Foran, President and CEO of WalMart U.S., on an conference call with reporters Thursday after the release of his company's third quarter earnings. "It's absolutely appropriate that we open at 6 p.m."
WalMart (WMT)is technically open 24 hours, but the retailer's special deals that lure the big crowds will commence at 6 p.m. this year, the same as last year. Critics have chided it and other retailers like Macys (M) and J.C. Penney (JCP) for starting Black Friday deals on Thanksgiving Day in recent years, arguing that employees of those companies should instead be at home enjoying time with their families. Share your story: Are you working on Thanksgiving or Black Friday? WalMart, however, contends that those workers are well taken care of. They get extra holiday pay, special employee discounts, and food. The discount retailer plans to have more employees working on Thanksgiving this year. In an of acknowledgment of the shopping frenzy that usually occurs Thanksgiving night, WalMart said it's beefing up security and adding more checkout stations than ever before. In 2008, a WalMart employee died when customers at a Long Island, N.Y. store stampeded in on Black Friday. "We do feed them, look after them, and we will be deliberately ensuring we have more checkouts open," claimed Foran. He said rewarding employees is "part of the DNA of our business." 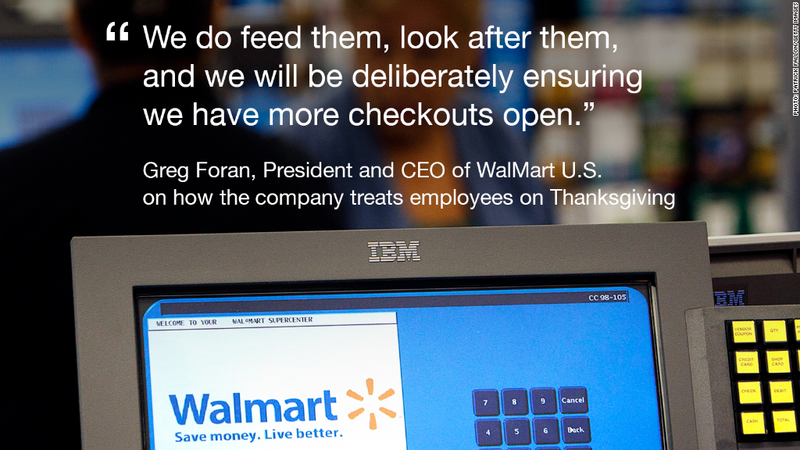 As for the kind of food being served to employees on Thanksgiving, a WalMart spokeswoman said it was up to the employees at each store. Some opt for a traditional Thanksgiving meal, while others choose every day items like pizza or barbecue. WalMart's Sam's Club stores, however, will remain closed on Thanksgiving.